For those of you who have played around with hidden and protected operating system files, you may have noticed a hidden file in your C: drive called hiberfil.sys. You may have also noticed that it is quite large. hiberfil.sys is Windows' way of reserving disk space in the event you want to put your computer into hibernation, a power-saving state that allows you to resume full operation faster than it could from a clean boot. If you don't use this feature and would like to free up some disk space, you can turn this feature off. To turn off this feature, start a command prompt as an administrator and enter powercfg.exe /hibernate off. Hibernation should now be turned off. To check, run the command powercfg.exe /availablesleepstates. Hibernate should be missing from the list. hiberfil.sys should also disappear from your C: drive freeing up some disk space. 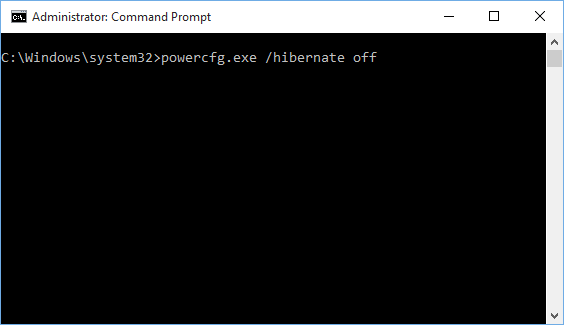 To turn hibernation back on, simply run the command powercfg.exe /hibernate on.